Ships, submarines, aircraft, troops and amphibious vehicles have been deployed in port cities across Russia displaying the force’s skills and capabilities to mark Navy Day. 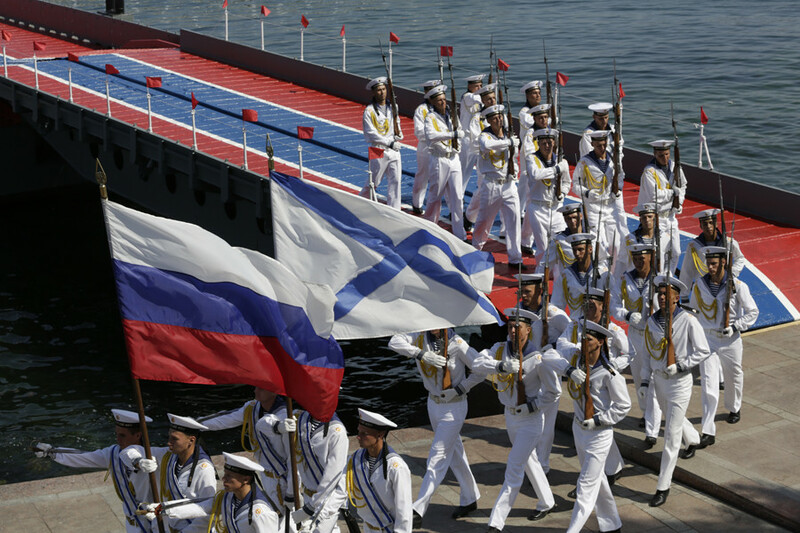 The day of celebrations commemorates the victories of Russian sailors and is celebrated each year on the last Sunday of July, with parades of the Pacific, Northern, Baltic and Black Sea fleets and the Caspian Flotilla. "On the last Sunday of July, we traditionally honor Navy servicemen and veterans, we congratulate workers of shipbuilding and repairing wharfs and research organizations of the military-industrial complex, all those who are inseparably connected with service at sea," Russia’s Defense Minister Sergey Shoigu said. This Sunday the celebrations kicked off, as is tradition, in Russia’s Far East with a parade of the Pacific Fleet in Amur Bay, where 20 warships and submarines were led by the missile cruiser Varyag. Anti-submarine ships Admiral Vinogradov and Marshal Shaposhnikov, the destroyer Bistry, and landing ship Nikolay Vilkov took part in the show. The Platform-M robot was the highlight of the military display in Petropavlovsk-Kamchatsky and Vladivostok. 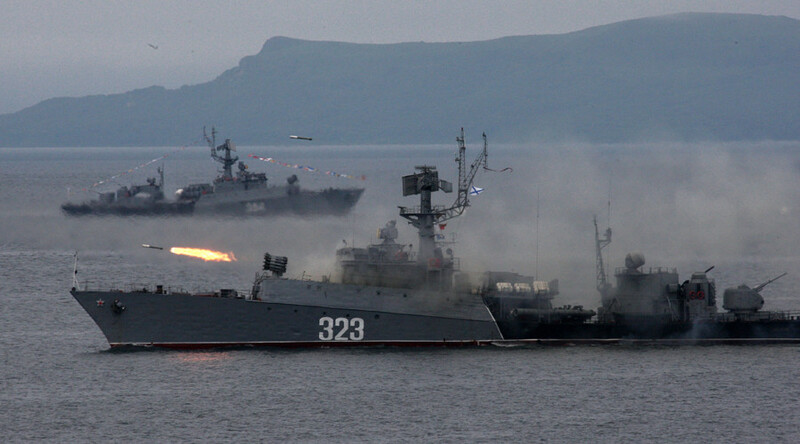 In Kamchatka’s Avachinsky Bay 15 warships and support vessels attended the celebrations. Over thirty warships, submarines, fast boats and support vessels, as well as more than 15 pieces of the coastal forces’ military equipment and more than two thousand troops of the Baltic Fleet appeared before crowds during the festive events on Sunday. President Vladimir Putin participated in the celebrations in the city of Baltyisk in the western Kaliningrad region, Russia’s exclave on the Baltic Sea. The Yury Ivanov communication vessel flew Russia's St. Andrew's colors for the first time as it joined the fleet on Sunday. 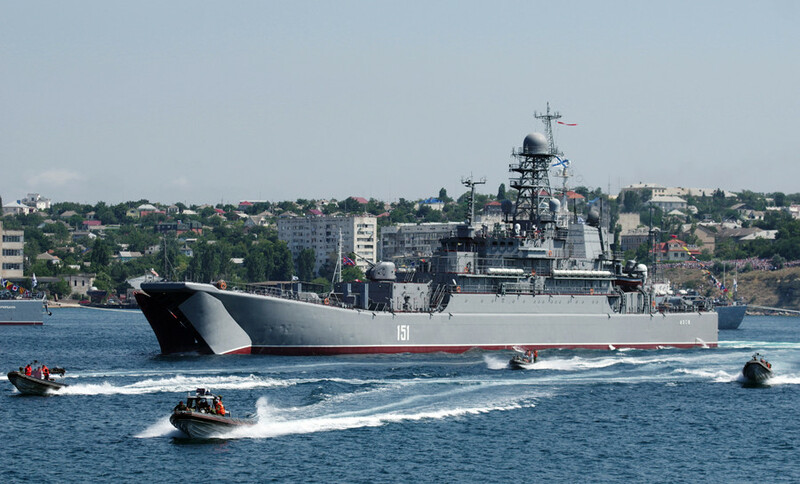 Other vessels such as the destroyer Nastoichiviy, assault landing ship Kaliningrad, frigate Admiral Grigorovich, corvette Stereguschy, diesel-electric submarine Stary Oskol and mine sweeper Alexey Obukhov cruised the Baltic waters. Eight crews of the Su-34 fullback bombers and MiG-31 interceptors appeared for the first time at the parade in Baltyisk. In Russia’s northern capital, St. Petersburg, 10 ships and vessels, including landing ship Minsk, anti-submarine vessel Urengoy and submarine Vyborg took part in the display. The Northern fleet in Severomorsk in the Murmansk Region surprised spectators by simulating a battle of an amphibious landing on the coast with the participation of air forces. Assault landing ships Georgy Pobedonosets and Kondopoga conducted the pretend attack, while armored personnel carriers tried to hamper the assault. 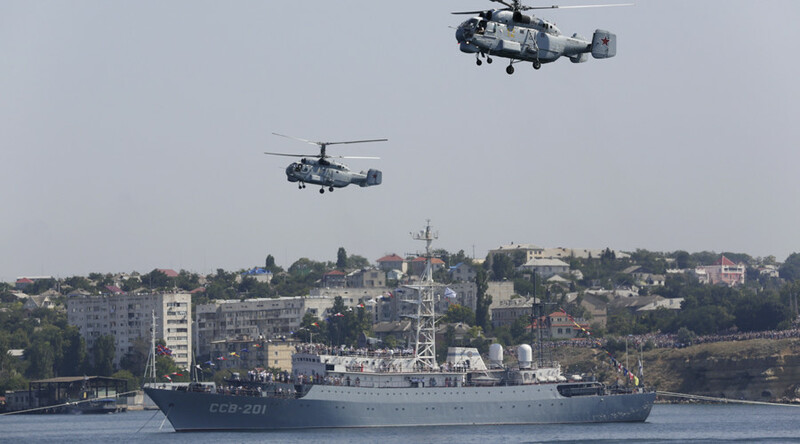 In Crimea, 20 ships, 35 aircrafts, 10 auxiliary vessels and 21 units of coastal military equipment graced the port of Sevastopol. Patrol ship Ladny orchestrated a fire at a simulated target. Following the parade, a video of the fire showing an apparent rocket launch failure appeared on YouTube. At the same time, the Kremlin issued a new edition of Russia's Naval Doctrine on the president’s official website. At a meeting with Russia’s top brass aboard the Admiral Gorshkov frigate in Baltyisk on Sunday, Putin said the key goal of the doctrine is to ensure comprehensive, consecutive and efficient naval policy to protect Russia's national interests. Chief Commander Viktor Chirkov also revealed that the RussianNavy will receive 10 warships and over 40 support vessels by the end of 2015, Rossiya 24 TV reported. "After 2015, we also plan the construction of submarines - the Borei, Yasen and Lada class ones," he added.